Escherichia coli RecA plays a crucial role in recombinational processes, the induction of SOS responses and mutagenic lesion bypasses. It has also been demonstrated that RecA protein is indispensable when it comes to the reassembly of shattered chromosomes in γ-irradiated Deinococcus radiodurans, one of the most radiation-resistant organisms known. Moreover, some functional differences between E. coli and D. radiodurans RecA proteins have also been shown. In this study, recA genes from Deinococcus geothermalis and Deinococcus murrayi, bacteria that are slightly thermophilic and extremely γ-radiation resistant, were isolated, cloned and expressed in E. coli. After production and purification, the biochemical properties of Dge RecA and Dmu RecA proteins were determined. Both proteins continued to exist in the solutions as heterogenous populations of oligomeric forms. The DNA binding by Dge RecA and Dmu RecA proteins is stimulated by Mg2+ ions. Furthermore, both proteins bind more readily to ssDNA when ssDNA and dsDNA are in the same reaction mixture. Both proteins are slightly thermostable and were completely inactivated in 10 s at 80°C. Both proteins hydrolyze ATP and dATP in the presence of ssDNA or complementary ssDNA and dsDNA, but not in the absence of DNA or in the presence of dsDNA only, and dATP was hydrolyzed more rapidly than ATP. They were also able to promote DNA strand exchange reactions by a pathway common for other RecA proteins. However, we did not obtain DNA strand exchange products when reactions were performed on an inverse pathway, characteristic for RecA of D. radiodurans. The characterization of Dge RecA and Dmu RecA proteins made in this study indicates that the unique properties of D. radiodurans RecA are probably not common among RecA proteins from Deinococcus sp. Deinococcus geothermalis DSM 11302 and Deinococcus murrayi DSM 11303 are gram positive, nonmotile, spherical bacteria living in aerobic conditions. Cells that divide as tetrads are very common in both species. D. geothermalis and D. murrayi form orange-pigmented colonies, are slightly thermophilic with an optimum growth temperature of between 45-50°C, but differ in optimum pH for growth. D. geothermalis DSM 11302 is slightly acidophilic and grows optimally at pH 6.5, while D. murrayi DSM 11303 is slightly alcaliphilic with an optimum pH for growth of 8.0, although both species were isolated from the hot springs which had alkaline pH values ranging from 8.6 to 8.9. D. geothermalis and D. murrayi were isolated from hot springs at São Pedro do Sul and Alcafache in central Portugal, respectively. The isolation of the acidophilic D. geothermalis strain from an alkaline site suggests that it can colonize the microenvironments of alkaline hot springs, such as biofilms, where the pH is lowered by other microorganisms . D. geothermalis is also able to grow on metallic surfaces of printing paper machines and it is known as an efficient primary biofilm, formerly functioning as an adhesion platform for secondary biofilm bacteria [2–4]. D. geothermalis and D. murrayi display an increased gamma radiation resistance, as would normally be found in the genus Deinococcus . The ability of these species to withstand high doses of ionizing radiation might result from an efficient RecA-dependent DSB repair system, similar to that recently described in Deinococcus radiodurans [5–7]. RecA protein is a crucial DNA dependent ATPase involved in DNA repair and homologous recombination. RecA proteins are found in most microorganisms within the Bacteria domain, but some insects' and clams' endocellular bacterial symbionts such as Buchnera aphidicola APS, B. aphidicola Sg, Blochmannia floridanus, B. pennsylvanicus, Wigglesworthia glossinidia, Vesiomyosocius okutanii and Ruthia magnifica lack the recA gene [8–13]. Its analogues such as RadA  or Rad51 [15, 16] are common in Archaea and Eucarya domains organisms. The product of the uvsX gene of the bacteriophage T4 also displays many RecA-like properties . RecA protein of E. coli, the best characterized RecA, is a multifunctional protein involved in homologous recombination , recombinational DNA repair  and SOS response to DNA damage and arrest of DNA replication . RecA filaments on ssDNA acts as a coprotease which facilitates the autoproteolysis of LexA protein. This results in the derepression of genes in the SOS regulon [21, 22]. RecA coprotease activity also facilitates the autocatalytic cleavage of the UmuD protein to the activated UmuD', a component of DNA polymerase V (UmuD'2C) [23–27]. Moreover RecA nucleoprotein filament transfers RecA-ATP complex to polymerase V to form an active mutasome UmuD'2C-RecA-ATP which catalyzes translesion DNA synthesis . In vitro, in the presence of Mg2+ ions and ATP, dATP or nonhydrolyzable ATP analogue ATP-γ-S, RecA assembles around single-stranded DNA into a catalycally active helical filaments [29–32]. No ATP or dATP hydrolysis is needed for nucleoprotein filament formation, although these nucleotides are hydrolyzed by RecA in the presence of ssDNA , during the disassembly of filaments . The active RecA filament is able to search out a homology between bound, single-stranded DNA and double-stranded molecules, and catalyzes the homologous pairing of DNA stands. These reactions also do not require cofactor hydrolysis and can occur in the presence of ATP-γ-S [35, 36]. The RecA protein of E. coli promotes both three-strand exchange reaction between homologous ssDNA and dsDNA molecules, and four-strand exchange between a duplex DNA with a single-stranded tail and a full dsDNA, where the strand exchange reaction is initiated in the single-stranded region [37, 38]. Although homologous pairing and DNA strand exchange can occur in the three-strand exchange reaction without ATP hydrolysis , ATP hydrolysis renders RecA protein-mediated DNA strand exchange unidirectional (5' to 3' with respect to the single-stranded DNA). In the presence of ATP-γ-S DNA strand exchange is bidirectional and limited in extent . Moreover, ATP hydrolysis allows a heterologous sequence bypass in one of the DNA substrates [40, 41], and is indispensable in the four-strand exchange reaction [41, 42]. In contrast to E. coli RecA, the RecA protein of D. radiodurans is able to promote the DNA strand exchange through an inverse pathway, where the double-stranded DNA is bound first and the homologous single-stranded DNA second . The aim of the present study was to clone, sequence and overexpress D. geothermalis DSM 11302 and D. murrayi DSM 11303 recA genes in E. coli. A biochemical characterization of recombinant Dge RecA and Dmu RecA proteins was performed. The primers for amplification of D. geothermalis DSM 11302 recA gene were designed on the basis of the known recA gene sequence of D. geothermalis DSM 11300 [GenBank: CP000359]. The obtained PCR product was cloned into a PCR-Blunt vector and sequenced. The nucleotide sequence of D. geothermalis DSM 11302 recA gene is available from the GenBank database under accession number EF447285. The predicted Dge RecA monomer protein contains 358 amino acid residues. A homology search performed using a version 3 FASTA programme at the EBI (European Bioinformatics Institute) revealed that the amino acid sequence of D. geothermalis DSM 11302 RecA shares 100% identity with D. geothermalis DSM 11300 RecA protein [GenBank: ABF46432], 87.6% identity and 95.9% similarity with D. radiodurans R1 RecA protein [GenBank: AAF11887], 71.1% identity and 91.6% similarity with Thermus aquaticus YT-1 RecA protein [GenBank: AAA19796], 71.0% identity and 89.8% similarity with T. thermophilus HB8 or T. thermophilus HB27 RecA proteins [GenBank: BAD71641 and AAS81808, respectively], 70.6% identity and 89.8% similarity with Meiothermus ruber DSM 1279 RecA protein [GenBank: ADD27511], 67.6% identity and 87.2% similarity with M. silvanus DSM 9946 RecA protein [GenBank: ADH62770], and 60.9% identity and 84.1% similarity with E. coli RecA protein [GenBank: CAA23618]. The D. murrayi DSM 11303 recA gene sequence was obtained using a two step procedure. In first step, the internal fragment of the recA gene was amplified using degenerated primers designed on the basis of an alignment of recA gene sequences from bacteria belonging to the Deinococcus-Thermus group. In the second step, flanking regions were amplified by inverse PCR. The obtained partial sequences of the D. murrayi recA gene were then aligned and the primers for amplification of the gene were designed. Afterwards, the PCR product was cloned using a CloneJET™ PCR Cloning Kit and sequenced. The nucleotide sequence of D. murrayi DSM 11303 recA gene was deposited in the GenBank database under accession number HM004587. The Dmu RecA protein contains 359 amino acid residues. The deduced amino acid sequence of D. murrayi DSM 11303 RecA shows 94.4% identity and 97.8% similarity with D. geothermalis DSM 11300 RecA protein, 86.9% identity and 96.9% similarity with D. radiodurans R1 RecA protein, 71.4% identity and 90.7% similarity with Thermus aquaticus YT-1 RecA protein, 70.7% identity and 89.2% similarity with T. thermophilus HB8 RecA protein, 70.3% identity and 89.5% similarity with Meiothermus ruber DSM 1279 RecA protein, 69.6% identity and 87.8% similarity with T. thermophilus HB27 RecA protein, 67.0% identity and 85.7% similarity with M. silvanus DSM 9946 RecA protein, and 62.3% identity and 86.0% similarity with E. coli RecA protein. 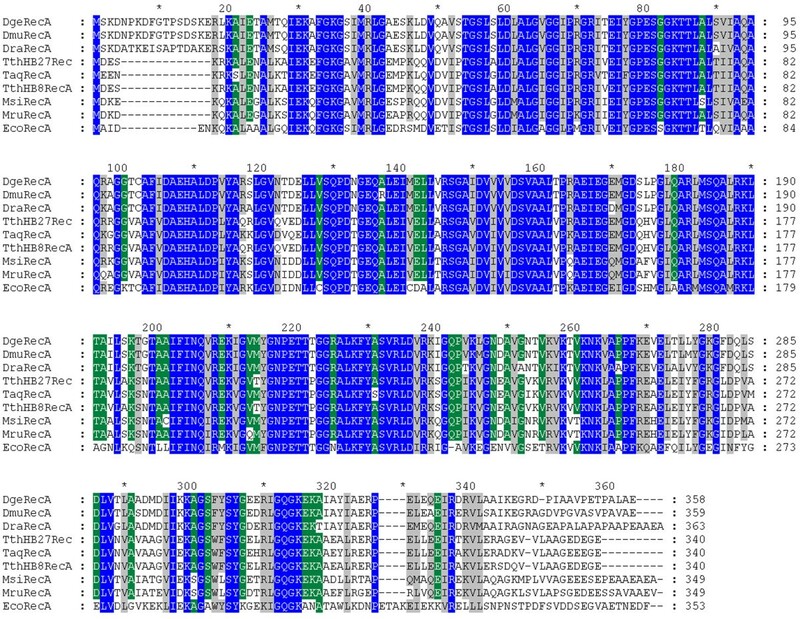 The multiple sequence alignment of RecA proteins from bacteria of the genus Deinococcus, Thermus and Meiothermus, and E. coli RecA protein is shown in Figure 1. Multiple sequence alignment of RecA proteins from bacteria belonging to the Deinococcus - Thermus group and E. coli RecA protein. DgeRecA - Deinococcus geothermalis DSM 11302 RecA, DmuRecA - D. murrayi DSM 11303 RecA, DraRecA - D. radiodurans R1 RecA, TthHB27Rec - Thermus thermophilus HB27 RecA, TaqRecA - T. aquaticus YT-1 RecA,TthHB8RecA - T. thermophilus HB8 RecA, MsiRecA - Meiothermus silvanus DSM 9946 RecA, MruRecA - M. ruber DSM 1279 RecA, EcoRecA - E. coli RecA. Three levels of conserved residues are indicated by blue (100%), green (80%) and grey (60%) backgrounds. The alignment was performed using Clustalx 2.0.11 program. In the next step, recombinant plasmids (pET-30Ek/LIC-Dge RecA and pET-30Ek/LIC-Dmu RecA for biosynthesis of RecA proteins from D. geothermalis and D. murrayi in E. coli T7 expression system) were constructed. After recA gene expression in the E. coli BLR(DE3) (recA-) cells, Dge RecA protein was purified by heat treatment of lysate at 60°C for 20 min and ion exchange chromatography. In the case of purification of Dmu RecA protein heat treatment was omitted due to its low thermostability. The purity of Dge RecA and Dmu RecA proteins at every step of production and purification was checked by SDS-PAGE after Coomassie Brilliant Blue R staining (Figure 2). SDS-PAGE analysis of the fractions obtained by expression and purification of Dge RecA and Dmu RecA proteins. Lane 1 - LMW SDS Marker (Amersham Biosciences AB): 97, 66, 45, 30, 20.1 and 14.4 kDa, lane 2 - cell extract of the E. coli BLR(DE3) + pET-30Ek/LIC-Dge RecA, lane 3 - Dge RecA after heat treatment, lane 4 - Dge RecA after chromatography on Fractogel EMD DEAE column, lane 5 - Dge RecA after chromatography on ResourceQ column, lane 6 - Dge RecA after chromatography on MonoQ column, lane 7 - Unstained Protein Molecular Weight Marker (Fermentas): 116, 66.2, 45, 35, 25, 18.4 and 14.4 kDa, lane 8 - cell extract of E. coli BLR(DE3) + pET-30Ek/LIC-Dmu RecA, lane 9 - Dmu RecA after chromatography on Fractogel EMD DEAE column, lane 10 - Dmu RecA after chromatography on ResourceQ column, lane 11 - Dmu RecA after chromatography on MonoQ column. The applied overexpression and purification systems produced about 63 mg of Dge RecA and 50 mg of Dmu RecA proteins from 1 L of E. coli culture. Analysis of the purified proteins by SDS-PAGE revealed major bands with a molecular mass of about 40 kDa for both Dge RecA and Dmu RecA proteins (Figure 2, lanes 6 and 11), which agreed with the amino acid sequence calculation; 38.157 kDa and 38.170 kDa, respectively. Summary of the purification process is shown in Table 1. Summary of the purification of Dge RecA and Dmu RecA proteins obtained from 1 L of E. col i BLR(DE3) culture. Oligomeric states of Dge RecA and Dmu RecA proteins at a concentration range between 3 and 58 μM in 25 mM potassium phosphate buffer pH 7.5 containing 1 M KCl were analyzed by gel filtration. The oligomeric states of examined proteins depend highly on their level of concentration. At high concentrations in solutions (58 and 29 μM) both RecA proteins exist as a heterogenous population of oligomeric forms ranging in size from dimers (elution volume near 14 ml) to long protein filaments and highly aggregated structures (elution near the void volume of 8.25 ml). Furthermore in such conditions, a greater percentage of Dge RecA and Dmu RecA proteins exist as big oligomers, although in the case of Dmu RecA significant amounts of dimers and trimers (elution volume near 14 and 13 ml, respectively) were also present. At 6 and 3 μM concentrations both proteins eluted at volumes corresponding mainly to the small oligomers and probably monomers in the case of Dmu RecA protein (Figure 3). Effects of Dge RecA (A) and Dmu RecA (B) proteins concentrations on the elution profiles of gel filtration. In panel A elution volume of 9.73 ml corresponding to the 14-meric protein; elution volume of 10.15 ml corresponding to the 12-meric protein; elution volumes of 10.60 and 12.52 ml corresponding to 10-meric and tetrameric proteins, respectively; elution volumes of 10.79 and 13.58 ml corresponding to 9-meric and trimeric proteins, respectively; elution volumes of 11.10 and 14.24 ml corresponding to octameric and dimeric proteins, respectively. In panel B elution volumes of 8.44, 8.48, 8.38 and 8.26 ml corresponding to protein agregates; elution volumes of 9.94, 13.22 and 14.29 ml corresponding to 13-meric, trimeric and dimeric proteins, respectively; elution volumes of 10.56, 13.30 and 14.35 ml corresponding to 10-meric, trimeric and dimeric proteins, respectively; elution volume of 11.12 ml corresponding to the octameric protein; elution volume of 13.24 ml corresponding to the trimeric protein; elution volume of 14.46 ml corresponding to the dimeric protein. To determine the ability of Dge RecA and Dmu RecA proteins to bind ssDNA, we carried out agarose gel mobility assays with 5'-end fluorescein-labelled (dT)35-oligonucleotides. The assays were carried out with increasing concentration of Mg2+ ions and at various temperatures between 25 and 75°C. We observed, that ssDNA binding by RecA proteins was stimulated by Mg2+ ions and was the most efficient at 8 and 10 mM Mg2+ (Figure 4). Dge RecA was able to bind oligo(dT)35 at temperatures between 25 and 58°C while Dmu RecA exhibited activity between 25 and 54.5°C, although at the highest temperatures, 58°C for Dge RecA and 54.5°C for Dmu RecA, the ssDNA binding was very slight (Figure 5). Binding of Dge RecA (A) and Dmu RecA (B) to 5'-end fluorescein-labeled (dT) 35 -oligonucleotides in the presence of various Mg 2+ ions concentrations at 37°C - gel mobility shift assays. Lane 1 - oligo(dT)35, lane 2 - 0 mM Mg2+, lane 3 - 2 mM Mg2+, lane 4 - 4 mM Mg2+, lane 5 - 6 mM Mg2+, lane 6 - 8 mM Mg2+, lane 7 - 10 mM Mg2+. Binding of Dge RecA (A, B) and Dmu RecA (C, D) to 5'-end fluorescein-labeled (dT) 35 -oligonucleotides in the presence of 10 mM Mg 2+ at various temperatures - gel mobility shift assays. Panel A: lane 1 - oligo(dT)35, lane 2 - 25.0°C, lane - 3 - 31.1°C, lane 4 - 38.2°C, lane 5 - 45.3°C, lane 6 - 51.1°C, lane - 7 - 58.0°C, lane 8 - 65.3°C, lane 9 - 72.2°C, lane 10 - 75.0°C; panel B: lane 1 - oligo(dT)35, lane 2 - 55.0°C, lane 3 - 55.9°C, lane 4 - 57.1°C, lane 5 - 58.0°C, lane 6 - 59.4°C; panel C: lane 1 - oligo(dT)35, lane 2 - 25.0°C, lane - 3 - 25.9°C, lane 4 - 28.7°C, lane 5 - 33.1°C, lane 6 - 37.9°C, lane - 7 - 42.6°C, lane 8 - 47.4°C, lane 9 - 52.1°C, lane 10 - 56.9°C, lane 11 - 61.2°C, lane 12 - 64.1°C, lane 13 - 65.0°C; panel D: lane 1 - oligo(dT)35, lane 2 - 52.0°C, lane 3 - 53.2°C, lane 4 - 54.5°C, lane 5 - 55.6°C. We examined also the ability of RecA proteins from D. geothermalis and D. murrayi to bind dsDNA in the absence of magnesium ions and in the presence of 10 mM Mg2+. Both proteins were able to bind 600 bp PCR products and the dsDNA binding was stimulated by Mg2+ ions as well as in the case of ssDNA binding (Figure 6A and 6B, lanes 2 and 3). Afterwards, to determine what kind of DNA is more readily bound by Dge RecA and Dmu RecA proteins we carried out the reactions where 5'-end fluorescein-labelled oligo(dT)35 and 600 bp PCR product were in the same test tube. When ssDNA and dsDNA were included in the reaction mixture, ssDNA was bound preferentially by both RecA proteins, both in the absence and presence of magnesium ions (Figure 6A and 6B, lanes 5 and 6). We observed also that Dmu RecA bound dsDNA more efficient than Dge RecA in all conditions tested. Binding of Dge RecA (A) and Dmu RecA (B) to dsDNA in the absence and in the presence of heterologous ssDNA - gel mobility shift assays. Lane 1 - 600 bp PCR product, lane 2 - dsDNA binding products obtained in the absence of Mg2+ ions, lane 3 - dsDNA binding products obtained in the presence of 10 mM Mg2+ ions, lane 4 - 600 bp PCR product and 5'-end fluorescein-labeled oligo(dT)35, lane 5 - DNA binding products obtained in the absence of Mg2+ ions, lane 6 - DNA binding products obtained in the presence of 10 mM Mg2+ ions. Thermostability of RecA proteins was characterized as the longest time period needed for complete loss of visible ssDNA binding activity investigated by gel-mobility shift assay after incubation at given temperature. Dge RecA and Dmu RecA were incubated at temperatures between 50 and 80°C for 10 s - 180 minutes, in the absence or in the presence of 10 mM Mg2+. No significant loss of protein activity was observed after incubation at 50°C for 180 min. Dge RecA was also stable for 180 min at 57°C, while Dmu RecA lost activity within 15 min at this temperature. Both proteins incubated at higher temperatures displayed lower thermostability and at 80°C were completely inactivated in 10 s. The RecA protein from D. geothermalis was more thermostable than RecA from D. murrayi (Table 2). Moreover magnesium ions have no effect on the thermal stability neither Dge RecA nor Dmu RecA. Thermostability of Dge RecA and Dmu RecA proteins. ATP and dATP hydrolysis catalyzed by RecA proteins from D. geothermalis and D. murrayi was monitored with a coupled spectrophotometric assay. We studied the DNA and temperature dependence of Dge RecA and Dmu RecA activity. We also measured the ATPase activity of both proteins at various concentrations of ATP and dATP to determine their kinetic parameters. We found no detectable ATPase and dATPase activities of Dge RecA and Dmu RecA in the absence of DNA and in the presence of dsDNA only. Both proteins however were able to hydrolyze ATP and dATP in the presence of ssDNA and in the DNA strand exchange conditions, although the rates of ssDNA-dependent ATP or dATP hydrolysis were higher. Furthermore, both proteins hydrolyzed dATP more rapidly than ATP either in the presence of ssDNA or ssDNA and dsDNA in the same reaction mixture (Tables 3 and 4). The rates of ssDNA-dependent ATP and dATP hydrolysis increased with temperature for both proteins and peaked at 42°C and 45°C for Dmu RecA and Dge RecA, respectively (Table 5). Kinetic parameters for ATPase and dATPase activity of Dge RecA and Dmu RecA proteins are displayed in Tables 6 and 7. Effect of DNA on the rate of ATP and dATP hydrolysis catalyzed by Dge RecA. Reactions conditions: 37°C, 2.27 mM ATP or dATP. Effect of DNA on the rate of ATP and dATP hydrolysis catalyzed by Dmu RecA. Effect of temperature on the rate of ssDNA-dependent ATP and dATP hydrolysis catalyzed by Dge RecA and Dmu RecA. Reaction conditions: 2.27 mM ATP or dATP. Kinetic parameters for ATP and dATP hydrolysis catalyzed by Dge RecA. Kinetic parameters for ATP and dATP hydrolysis catalyzed by Dmu RecA. The ability of Dge RecA and Dmu RecA proteins to promote DNA strand exchange reaction was investigated in the presence of ATP or dATP, ATP-regenerating system and Dge SSB protein (obtained according to a procedure by Filipkowski et al. ), at 42°C for Dmu RecA and 45°C for Dge RecA. At first, filaments composed of ssDNA and RecA protein were formed. Afterwards, linear complementary dsDNA was added to start DNA strand exchange. After incubation and at various time periods, reactions were halted by protein degradation. As shown in Figure 7, Dge RecA and Dmu RecA promoted homologous DNA strand exchange either in the presence of ATP or dATP as evidenced by forming nicked circular dsDNA products, although the products appeared earlier when reactions were performed with ATP. Moreover DNA strand exchange occurred faster when Dmu RecA was used. We also performed DNA strand exchange reactions via an inverse pathway, where RecA proteins were preincubated with the linear dsDNA and circular ssDNA was then added to initiate reactions, however we do not observe nicked circular dsDNA products even after 90 min of incubation. DNA strand exchange promoted by Dge RecA (A, C) and Dmu RecA (B, D) proteins. Panels A and B: lane 1 - M13mp18 ssDNA, lane 2 - M13mp18 dsDNA digested with Sma I, lane 3 - reaction products formed after 15 min, lane 4 - reaction products formed after 30 min, lane 5 - reaction products formed after 45 min, lane 6 - reaction products formed after 60 min, lane 7 - reaction products formed after 75 min, lane 8 - reaction products formed after 90 min. P - nicked circular dsDNA. Panels C and D: plots of the quantified product formation for the reactions in panels A and B. In this article, the cloning, purification and initial characterization of RecA proteins from slightly thermophilic and extremely radioresistant bacteria D. geothermalis and D. murrayi are described. The Dge RecA and Dmu RecA exhibit many properties common to this class of proteins. In the absence of DNA both proteins self-assemble into a variety of oligomers, their size strongly depending on the concentration of protein in the solution, a characteristic of RecA proteins. Although oligomeric populations of T. aquaticus and T. thermophilus RecA proteins contain a large percentage of hexamers [45–48], it was impossible in our study to determine the preferred oligomeric state of Dge RecA and Dmu RecA. RecA proteins of D. geothermalis and D. murrayi bind both ssDNA and dsDNA like other RecA proteins. However, it was demonstrated that RecA protein of D. radiodurans binds preferentially to double-stranded DNA even when ssDNA is present in the reaction mixture [49, 50]. In contrast to Dra RecA, Dge RecA and Dmu RecA bind more readily to single-stranded DNA when both ssDNA and dsDNA are in the same reaction mixture. RecA proteins of D. geothermalis and D. murrayi are DNA-dependent ATPases. In the absence of DNA, ATP or dATP, hydrolysis was not detected. A similar result was demonstrated for D. radiodurans RecA . In contrast, ATP hydrolysis in the absence of exogenous DNA was detected for E. coli RecA protein, although the rate was significantly reduced . Unlike Dra RecA protein [49, 50], the Dge RecA and Dmu RecA proteins were not able to perform ATP or dATP hydrolysis in the presence of dsDNA at pH 7.5. The same results were shown for T. thermophilus and E. coli RecA proteins [33, 51], although Eco RecA protein hydrolyses ATP in the presence of dsDNA at lower pH (optimum near pH 6) . The ATP and dATP hydrolysis catalyzed by RecA proteins of D. geothermalis and D. murrayi was stimulated by single-stranded DNA, and dATP was hydrolyzed faster than ATP. These results are consistent with the results obtained for RecA proteins of E. coli and D. radiodurans [33, 49]. Both Dge RecA and Dmu RecA as well as Eco RecA and Dra RecA were able to promote DNA strand exchange using ATP or dATP as a cofactor [41, 49]. However, in the presence of dATP nicked circular heteroduplex products formed more slowly than in the presence of ATP. Similar results were also obtained for RecA protein of D. radiodurans . The major difference between E. coli and D. radiodurans RecA proteins is the ability to promote DNA strand exchange using inverse pathways. The Eco RecA initiates DNA strand exchange with a filament bound to the ssDNA, while the Dra RecA binds dsDNA first and homologous ssDNA second . In our study, we did not obtained the product of DNA strand exchange reactions initiated with Dge RecA-dsDNA or Dmu RecA-dsDNA filaments, although Sghaier et al. demonstrated that RecA protein of D. geothermalis is able to promote DNA exchange reactions through normal and inverse pathways. The difference in results obtained by Sghaier et al. and us may be due to differences in the conditions of the DNA strand exchange reactions, especially the differences in the length of dsDNA fragments used. In our study, we performed DNA strand exchange reactions between full length linear M13mp18 dsDNA (7249 bp) and circular M13mp18 ssDNA, whereas Sghaier et al. used a short fragment of ΦX174 dsDNA obtained by digestion with Hin cII endonuclease (the longest DNA fragment obtained by Hin cII digestion of ΦX174 RFI and its size was 1057 bp) and circular ΦX174 ssDNA (5386 nt). RecA proteins of D. geothermalis and D. murrayi are active at elevated temperatures similarly to RecA of T. thermophilus. The optimum temperature for Tth RecA ATPase activity is 65°C , and for Dge RecA and Dmu RecA proteins is 45 and 42°C, respectively. However, they are able to bind ssDNA at temperatures reaching 54.5°C for Dmu RecA and 58°C for Dge RecA. Moreover, the thermostability assay revealed that the Dge RecA and Dmu RecA are less thermostable than Tth RecA which remains still active after a 10-s incubation at 85°C (data not shown), whereas Dge RecA and Dmu RecA are completely inactivated in 10 s at 80°C. The properties of RecA proteins of slightly thermophilic and extremely radioresistant bacteria D. geothermalis and D. murrayi obtained in this study demonstrate that they are close functional homologues of the other RecA proteins. Although it has previously been shown that the RecA protein of the extremely radioresistant bacterium D. radiodurans exhibits some unusual properties, in our study we did not observe such properties in the case of Dge RecA and Dmu RecA. This suggests the uniqueness of Dra RecA even among RecA proteins from microorganisms of the Deinococcus genus. On the other hand, it has been also demonstrated that the dsDNA-binding preferences displayed by Dra RecA are not necessary for double-stranded breaks repair in γ-irradiated D. radiodurans. The rapid reconstruction of an intact genome occurring through an extended synthesis-dependent strand annealing process (ESDSA) followed by a DNA recombination requires a 5'-3' single-stranded DNA exonuclease RecJ, a RecQ helicase and a RecF, RecO and RecR proteins to act together to promote loading of RecA onto single-stranded DNA . D. geothermalis DSM 11302 and D. murrayi DSM 11303 were purchased from Deutsche Sammlung von Mikroorganismen und Zellkulturen (Braunschweig, Germany). They were grown in 50 ml modified Luria-Bertani medium pH 7.2 containing 1 g peptone K, 1 g yeast extract and 7.4 g sea salt in 1000 ml distilled water. D. geothermalis was grown for 30 h at 50°C and D. murrayi was grown for 30 h at 47°C. Afterwards genomic DNA was isolated using Genomic Mini AX Bacteria (A&A Biotechnology, Poland). The recA gene was amplified by PCR using genomic DNA from D. geothermalis DSM 11302 as the template. The primers used were: DGRAFNde 5' CGACAT ATG AGCAAGGAACAACCCCAAGGA 3', containing recognition site for Nde I endonuclease (underlined) and DGRARHnd 5' ACAAAGC TT A CTCTGCCAAGGCGGGC 3', containing recognition site for Hin dIII endonuclease (underlined). The start and stop codons are bolded. The reaction mixture consisted of 0.13 μg of D. geothermalis DNA, 0.2 μM of each primer, 200 μM of each dNTP, 2 mM MgSO4 and 1 U of Delta3 DNA polymerase (DNA-Gdańsk, Poland) in 1 × PCR buffer (20 mM Tris-HCl pH 8.8, 10 mM KCl, 10 mM (NH4)2SO4, 0.1% Triton X-100). PCR reaction was performed using the following conditions: 95°C - 2 min, (95°C - 1 min, 61°C - 1 min, 72°C - 1 min; 30 cycles), 72°C - 5 min. The PCR product was cloned into the pCR-Blunt vector (Invitrogen, Carlsbad, California, USA) and sequenced. The obtained pCR-Blunt-NdeI-Dge RecA-HindIII plasmid was then digested with Nde I and Hin dIII endonucleases, and the DNA fragment containing the recA gene was cloned into pET-30 Ek/LIC expression vector (Novagen, Beeston, Nottingham, England) digested with the same restriction enzymes. The resulting recombinant plasmid pET-30Ek/LIC-Dge RecA was used for the production of D. geothermalis RecA protein in E. coli. In order to obtain an internal part of the recA gene from D. murrayi DSM 11303, sequences encoding RecA proteins of Deinococcus geothermalis DSM 1300, D. geothemalis DSM 11302, Deinococcus radiodurans R1, Thermus aquaticus YT-1, Thermus thermophilus HB8 and T. thermophilus HB27 obtained from the GenBank database were aligned using the ClustalX program, version 1.8. Based on the alignment, degenerated primers InvRecA1 5' GAGTCSGGSGGCAAGACCAC 3' and InvRecA2 5' TCCTTSCCCTGGCCSAKGC 3' were designed and synthesized. The PCR reaction was performed in the mixture containing: 0.2 μM of each primer, 0.2 μg of D. murrayi DSM 11303 genomic DNA, 200 μM of each dNTP, 3 mM MgCl2 and 1 U of DNA polymerase Hypernova (DNA-Gdańsk, Poland) in 1 × buffer Hypernova (10 mM Tris-HCl pH 8.8, 50 mM KCl, 0.15% Triton X-100). The reaction mixture was incubated for 2 min at 95°C, followed by 30 cycles at 95°C for 1 min, 59°C for 1 min, 72°C for 1 min, and a final incubation for 5 min at 72°C. The obtained PCR product was then purified from an agarose gel band using Gel-Out kit (A&A Biotechnology, Poland), cloned into pJET1.2/blunt vector CloneJET™ PCR Cloning Kit (Fermentas, Vilnius, Lithuania) and sequenced. Afterwards, the inverse PCR was performed for obtaining of flanking regions. The D. murrayi genomic DNA was first digested with Dra I restriction endonuclease and then restriction fragments were ligated upon itself to form circles. In the second step, the PCR amplification was performed using ligation products as a template and two primers: recAInvFor 5' CCGCAAGATTGGGCAGCCCGTCAAGA 3' and recAInvRev 5' ACCCGACCGCACGAGCAGCTCCATG 3', designed on the basis of previously obtained partial sequence of D. murrayi recA gene. The reaction mixture contained also 200 μM of each dNTP, 3 mM MgCl2 and 1 U of DNA polymerase Hypernova (DNA-Gdańsk, Poland) in 1 × buffer Hypernova. DNA amplification was performed using the following conditions: 95°C - 3 min, (95°C - 1.5 min, 66°C - 1 min, 72°C - 5 min) 30 cycles and 72°C - 15 min after the final cycle. 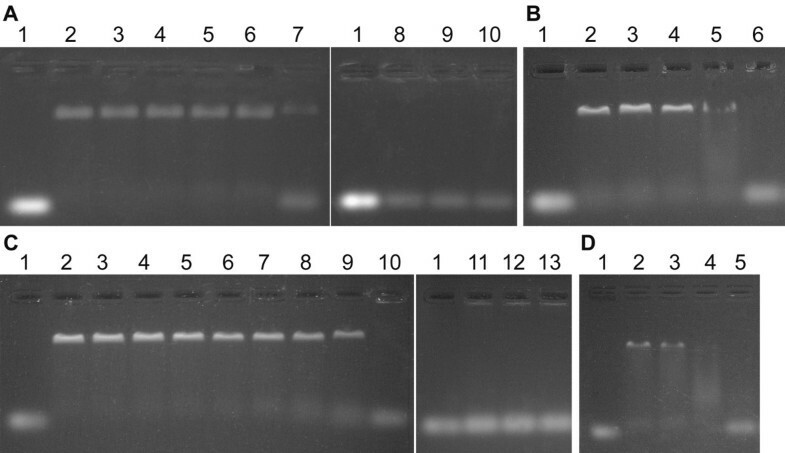 The PCR product was purified from an agarose gel band, cloned into pJET1.2/blunt vector and sequenced. Afterwards, fragments of D. murrayi genomic DNA sequence were alignment and the full sequence of recA gene was obtained. The D. murrayi DSM 11303 recA gene was then amplified using the forward primer FDMRecANdeI 5' ATTACAT ATG AGCAAGGACAACCCCAAGGACTTC 3', and the reverse primer RDMRecAXhoI 5' TATTCTCGAG TTA CTCCGCGACAGCGGGCAC 3', containing Nde I and Xho I recognition sites, respectively (underlined). The start and stop codons are bolded. The PCR reaction mixture contained: 0.2 μM of each primer, 0.2 μg of D. murrayi genomic DNA, 200 μM of each dNTP, 3 mM MgCl2 and 1 U of DNA polymerase Hypernova (DNA-Gdańsk, Poland) in 1 × Hypernova buffer. The reaction mixture was incubated for 3 min at 96°C, followed by 5 cycles at 95°C for 1 min, 58°C for 1 min, 72°C for 1 min and 25 cycles at 95°C for 1 min, 63°C for 1 min, 72°C for 1 min, and a final incubation for 5 min at 72°C. 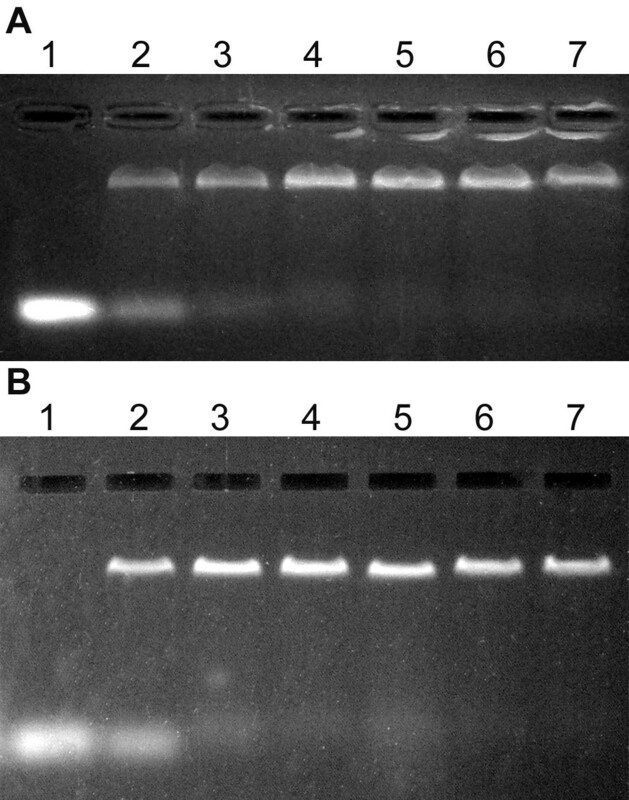 Afterwards, PCR product was purified from an agarose gel band, cloned into pJET1.2/blunt vector and sequenced. The obtained pJET-NdeI-Dmu RecA-XhoI plasmid was then digested with Nde I and Xho I endonucleases, and the DNA fragment containing the recA gene was cloned into pET-30 Ek/LIC expression vector (Novagen) digested with the same restriction enzymes. The resulting recombinant plasmid pET-30Ek/LIC-Dmu RecA was used for the production of D. murrayi RecA protein in E. coli. Overproduction of Dge RecA and Dmu RecA proteins was performed in the E. coli BLR(DE3) cells (Novagen) carrying the pET-30Ek/LIC-Dge RecA or pET-30Ek/LICDmu RecA plasmids. Cells were grown at 37°C in 750 ml LB medium (1% peptone K, 0.5% yeast extract, 1% NaCl) containing 20 μg/ml of kanamycin. At OD600 0.5 IPTG was added to the final concentration of 1 mM and cultivation was continued for 4 hours. Subsequently, cultures were centrifuged (4612 × g, 10 min, 4°C) and pellets were resuspended in 75 ml of buffer A1 (20 mM potassium phosphate buffer pH 6.0, 50 mM KCl, 1 mM EDTA, 1 mM DTT) in the case of Dge RecA protein production or buffer A2 (20 mM potassium phosphate buffer pH 6.5, 50 mM KCl, 1 mM EDTA, 1 mM DTT ) for the Dmu RecA. Samples were sonicated seven times for 30 s at 0°C and centrifuged (4612 × g, 10 min, 4°C). The supernatant containing Dge RecA protein was heat-treated at 60°C for 20 min, cooled on ice and centrifuged again (18000 × g, 30 min, 4°C). Dge RecA and Dmu RecA proteins were then purified using Fractogel EMD DEAE column (Merck, Darmstadt, Germany) equilibrated with buffer A1 or A2, respectively. RecA proteins were eluted with linear gradient of 0.05-1.5 M KCl in the appropriate buffer. Fractions containing D. geothermalis or D. murrayi RecA were pooled, dialyzed against buffer A1 or A2 and loaded onto ResourceQ column (Amersham Biosciences AB, Uppsala, Sweden). Elution was performed by linear gradient of 0.05-0.425 M KCl in buffer A1 or A2. Fractions containing RecA proteins were dialyzed against buffer A1 or A2 once again and purified using MonoQ column (Amersham Biosciences AB). Dge RecA and Dmu RecA were eluted with linear gradient of 0.05-0.35 M KCl in appropriate buffer. Collected fractions containing purified RecA proteins were then checked for nucleases contaminations by incubating them with M13mp18 RFI DNA (24 μM of nucleotides), linear dsDNA M13mp18 (24 μM of nucleotides) and circular ssDNA M13mp18 (12 μM of nucleotides) in the 20 mM potassium phosphate buffer pH 7.5 containing 10 mM MgCl2. The concentration of RecA proteins was 10 μM. Reaction mixtures were incubated at 37°C for 2 h and then EDTA, SDS and Proteinase K were added to the final concentrations of 10 mM, 1% and 2 mg/ml, respectively. Samples were incubated at room temperature for 30 min and separated by electrophoresis in 1% agarose gels with ethidium bromide. DNAs were also incubated with Proteinase K only, as a control sample. We did not observe any exo- or endonuclease activities neither in RecA proteins preparations nor in Proteinase K. Afterwards the RecA proteins were dialyzed against 100 mM (NH4)HCO3 and lyophilized for long-time storage. The purity of proteins was investigated by SDS-PAGE. The concentration of RecA proteins at every step of production and purification was measured by Bradford method . Protein concentration in the samples for biochemical tests was determined by A280 nm using an extinction coefficient of 11,920 M-1 cm-1, which was calculated from the amino acid sequences of Dge RecA and Dmu RecA proteins. The molecular mass of Dge RecA and Dmu RecA proteins were estimated using analytical gel filtration chromatography. Samples containing various concentrations of purified proteins were loaded onto Superdex 200 HR 10/30 column (Amersham Biosciences AB) equilibrated with 25 mM potassium phosphate buffer pH 7.5 containing 1.0 M KCl and eluted with the same buffer at a flow rate of 0.5 ml/min. The elution profiles were monitored by recording the absorbance at 214 nm. The molecular weights of Dge RecA and Dmu RecA oligomers were determined by comparison with those of standard proteins: thyroglobulin (669 kDa), apoferritin (443 kDa), β-amylase (200 kDa), alcohol dehydrogenase (150 kDa), bovine serum albumin (66 kDa) and carbon anhydrase (29 kDa). The ability of Dge RecA and Dmu RecA proteins to bind ssDNA was investigated by electrophoretic mobility shift of fluorescein 5'-end-labelled oligo(dT)35 nucleotides. 25 μl reaction mixtures containing 5.6 μM (nucleotides) oligo(dT)35, 110 μM ATP-γ-S, 300 μM ATP, from 0 to 10 mM MgCl2 and 9 μM RecA protein in 20 mM potassium phosphate buffer pH 7.5 were incubated at 25-75°C for 30 min in the dark. Afterwards samples were separated by electrophoresis in 0.8% agarose gels. Results were visualized using UV transilluminator. The ability of Dge RecA and Dmu RecA proteins to bind dsDNA was investigated by electrophoretic mobility shift of 600 bp PCR product (λ DNA amplified using 5' GGACAAGGTCGCTGAAGCCTTCG 3' and 5' TCCTGACGGGCGGTATATTTCTCC 3' primers). 25 μl reaction mixtures containing 30 μM (nucleotides) dsDNA or 30 μM dsDNA and 14 μM ssDNA (fluorescein 5'-end-labelled oligo(dT)35), 180 μM ATP-γ-S, 500 μM ATP, 0 or 10 mM MgCl2 and 12 μM RecA protein in 20 mM potassium phosphate buffer pH 7.5 were incubated at 37°C for 30 min. Afterwards samples were separated by electrophoresis in 0.8% agarose gels containing ethidium bromide. Results were visualized using UV transilluminator. The thermostability of Dge RecA and Dmu RecA was determined by ssDNA binding activity after incubation of proteins at various temperatures for a set of time periods. The samples containing 11.8 μM RecA protein and 0 or 10 mM MgCl2 in 20 mM potassium phosphate buffer pH 7.5 were incubated at 50-80°C for 10 s to 180 min, cooled on ice and centrifuged (13500 × g, 10 min). Aliquots (19 μl) were then taken and fluorescein 5'-end-labelled oligo(dT)35 nucleotides, ATP, ATP-γ-S and MgCl2 were added to the concentrations of 5.6 μM, 300 μM, 110 μM and 10 mM in the final volume of 25 μl, respectively. Subsequently reaction mixtures were incubated at 37°C for 30 min in the dark and separated by electrophoresis in 0.8% agarose gels. Results were visualized using UV transilluminator. Hydrolysis of ATP (or dATP) by Dge RecA and Dmu RecA was monitored by an enzyme coupled method. Regeneration of ATP from ADP and phosphoenolpyruvate catalyzed by pyruvate kinase was coupled with the conversion of NADH to NAD+ catalyzed by lactate dehydrogenase, which was monitored by a decrease in absorbance at 355 nm. The absorbance was measured using PerkinElmer multilabel plate reader Victor3 V (Centre of Excellence ChemBioFarm, Gdańsk University of Technology, Gdańsk, Poland). The reaction mixtures consisted of: 3.03 μM RecA protein, 11.56 mM MgCl2, 1.25 U of lactate dehydrogenase from rabbit muscle, 0.75 U of pyruvate kinase from rabbit muscle, 3.3 mM NADH, 2.27 mM PEP, 0.38-2.27 mM ATP (or dATP) and 20 mM Tris-HCl buffer pH 7.5 to the end volume of 75 μl. Reactions were carried out in the absence of DNA and in the presence of 12.16 μM (nucleotides) ssDNA of SygB1a oligonucleotide 5' CGTTCGAAACGATGAGGAAGACTTATTGGCTGATGGCGCTTTTCGCGGTGCTCATGTTCCCTGAAAAGTTCCTTTGGGGT 3' (80 nt) and/or 1,312 μM (nucleotides) of Xba I-linearized dsDNA of pBADTOPOβAQa plasmid (5727 bp) containing complementary sequence to the SygB1a oligonucleotide. ATP (or dATP) hydrolysis reactions were performed at 32, 37, 42, 45 and 50°C. RecA-dependent DNA strand exchange reactions were carried out between circular ssDNA of M13mp18 and linear dsDNA of M13mp18 obtained by Sma I digestion. All reactions were carried out in solutions containing 20 mM Tris-HCl buffer pH 7.5, 5 μM RecA protein, 9 μM (nucleotides) ssDNA, 18 μM (nucleotides) dsDNA, 0.3 μM Dge SSB protein , 1.2 mM DTT, 10 mM MgCl2, 3 mM ATP and an ATP-regenerating system (0.5 U pyruvate kinase from rabbit muscle, 3 mM phosphoenolpyruvate) in 25 μl. A preincubation of ssDNA with Dge RecA at 45°C or with Dmu RecA at 42°C for 5 min was followed by addition of ATP or dATP and SSB. After an additional 5 min incubation, linear dsDNA was added to start the strand exchange reactions. The reactions were carried out at 45°C when Dge RecA was used or at 42°C in the case of Dmu RecA for 15, 30, 45, 60, 75 and 90 min and stopped by addition of EDTA, SDS and Proteinase K to the final concentrations of 10 mM, 1% and 2 mg/ml, respectively. Samples were incubated at room temperature for 30-90 min and then separated by electrophoresis in 0.8% agarose gels. Results were visualized and photographed with UV light using VersaDoc™ Imaging System (Bio-Rad Laboratories, Hercules, California, USA) after staining of gels with ethidium bromide. The DNA bands were quantified with Quantity One software, version 4.3.1 (Bio-Rad Laboratories). The band corresponding to nicked circular dsDNA product was quantified as the fraction of the total DNA in a given gel lane, excluding the band corresponding to the ssDNA. In the case of inverse DNA strand exchange reactions, RecA proteins were preincubated with the linear dsDNA and ATP or dATP for 15-60 min. The ssDNA was then added to start the reactions, and the SSB was added 5 min later. This work was supported by the Polish Ministry of Science and Higher Education Grant N N302 067934 to J.K. We thank Dr. P. Filipkowski for pBAD-DgeSSB plasmid used in this study. MW participated in the design of the study, partially characterized of RecA proteins and drafted the manuscript; PH obtained and partially characterized of RecA proteins; BK partially characterized of RecA proteins; JK corrected and edited the final version of manuscript. All authors read and approved the final manuscript.